If I had to describe our honeymoon in Costa Rica in two words, I would say "Sublime Nothing". Of course, our idea of a good vacation involves the luxury of not having to do anything at all. 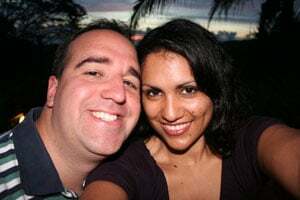 After 14-months of planning the wedding, on top of me finishing grad school and my husband starting a new job as a newly minted Patent Agent, we looked forward to our 7-days of nothing post-wedding. With an open agenda and a few books packed in for good measure, we set out to our honeymoon two days after the wedding ready to relax. Choosing Costa Rica as our honeymoon destination was a no-brainer. We actually picked the resort first, and it turned out to be in Costa Rica. Everyone we knew that asked us the ubiquitous honeymoon question, "Where are you going?" reacted to "Costa Rica", with a gasp and some form of "I've only heard how gorgeous it is." We knew going in that we were in for a real treat. We didn't want to stay at a big resort with big buffets and so-so service. We found a piece of heaven in Costa Rica, a five-room boutique resort with 360 degree views of sea and jungle, perched atop a mountain. 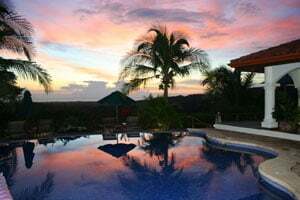 The resort is located in a rural coastal area, 20 miles from the beach town of Tamarindo. Los Altos de Eros, which translates to the Heights of Love, is ranked at the top of Travel Advisor's Best of 2008 list, including #1 spots for best luxury resort and best service in the world. It was the beginning of the raining season so the jungle was lush and alive with sounds of nature howling through the air. Our driver met us at the Liberia airport and drove us the hour and a half to the resort. The scenic drive passed through several towns where we saw the locals partaking in their quotidian activities- children in uniforms walking home from school, a woman sweeping the sidewalk in front of her home. When we arrived at Los Altos, we were greeted by the staff, showed to our room and left to relax and unpack. Our room had a chilled bottle of the house white wine surrounded by bright purple flowers. What a delicious welcome to a truly blissful week! A couple of hours after we arrived, we experienced tropical storm Alma, making its way down the Pacific. For the first three days of our honeymoon, we watched it pour - so this is what a real rainforest shower is! The rain turned out to be a blessing in disguise. For those three days of non-stop rain, we were forced to relax, eat, nap and lounge. We also tucked into the spa where we enjoyed hour-long sunset massages, time in the hot tub, and private dinners. With just four other guests in the resort, we experienced the ultimate in service. 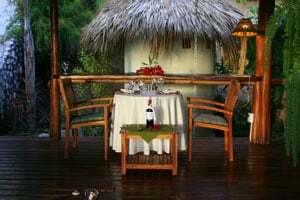 The open-air couple's massages melted our tension as the cool breeze of the jungle swept over us. No "sounds of the rainforest" CD required. The musical harmony of the rain, the breeze, and our own breathing was hypnotic. When the rain stopped, we went on a tour of a nearby active volcano, Rincon de la Vieja, where we braved zip lining and took mud baths. The zip ling here is world class- 10 magnificent rides over the jungle and waterfalls, at killer heights. To reach the first platform, we saddled up and trekked up the volcano on horses. The staff is fun and serious about adventure. They even had my new husband ride upside down. After this thrill, we joined a few other tourists in the hot springs/mud bath experience. The fun starts with the steam room, which is built on top of naturally boiling mineral water. Then it was onto the mud station, where one covers the body in black sulfur-scented volcano ash. A few minutes of letting the mud do it's magic leads on to the mud pools. The three mud pools were at three different temperatures- hot, warm, and frigid cold. You are supposed to start with the hot and work your way to the cold. Most people went straight for the warm and stayed there. We took a deep breath and went in the cold for 30 seconds. Looking at each other like accomplices, we laughed and screamed until we got out. Although the tour was fun, our favorite experiences during our honeymoon were the ones where we didn't plan to do anything at all. Every night we saw a beautiful sunset paint it's splendor allover the sky. We sat on our private patio, glasses of wine in hand, and fell into the sublime experience of sharing the beauty of nature together. After over a year of stress planning for the wedding, it was painfully enjoyable to do just that. Our heaven on earth honeymoon cost approximately $6300, enabled in no small part by the gifts made to our Traveler's Joy registry. Our guests raved about being able to give us an experience we would treasure for the rest of our lives. We had as much fun creating the gifts as we did turning them into memories. As we sipped drinks poolside, we toasted the generosity of our friends who bought them for us. Now that we are back from our unforgettable honeymoon, we are so thankful of how easy it was to receive and keep track of our gifts. Writing thank you cards was a cinch. We would definitely recommend Costa Rica, and the Los Altos de Eros resort to all honeymooners who want the ultimate in service, beauty, romance and relaxation, not to the mention the best couple's massage ever!